An architectural sculptor, James Charles Young was born in Lanark on 28 October 1839, the son of John Young, a mason in Lanark, and Janet Peat (or Pate) of Lesmahagow, who were married in August 1833. Moving to Lancashire, J C Young married Mary Charnock on 20th October 1868, at Scarisbrick. He became the father of four other sculptors and carvers: John (b. 1869), James Augustine (1871-1934), William C. (b. 1873) and Franklin (b. 1882), all of whom trained and worked with him. Returning to Scotland, he worked as a carver with John Mossman (of J & G Mossman ) before establishing his own family firm of sculptors after making his name with his carver-work on the Stewart Memorial Fountain in Kelvingrove Park from Mossman's models (1872). He set up his own workshop at 106 St Vincent Lane in 1873, later moving to 68 Bothwell Street; 197 Dumbarton Road; and 1103 Argyle Street. He initially traded under the name James Young until 1901, and then listed the firm's name as James C Young in the POD 's until 1910, by which time he had retired and his son, James Augustine, had assumed control of the firm and renamed it James Young & Son. Among his apprentices was the sculptor Archibald Dawson , who later became a partner, trading as Dawson & Young, 1927-36, Jack Mortimer, Andrew Willison and Edward Graham, who established their own firm of sculptors, Mortimer, Willison & Graham, after Young's firm closed. Young's family resided at various addresses: 18 Church Street, Partick, 1873; 47 Belgrave Street, 1874; 12 Franklin Terrace, Anderston, 1881; 297 Dumbarton Road, Partick, 1881; 41 St Vincent Crescent, Anderston, 1901; and 145 Buccleuch Street, 1923. The firm won many important tenders for architectural sculpture and carving in Glasgow, rivalling and eventually succeeding the Mossmans as the city's most prolific and important firm of sculptors at the end of the 19th Century. The carver-work on the Merchants' House, West George Street (1875-7); Cameron Street School (1877); the Fine Art Institute, Sauchiehall Street (1878-80); the Langside Battlefield Memorial (1887); the figures of St. Mungo and St. Ninian on the Calderwood Reredos, Glasgow Cathedral (1893, lost); the figures of Sowing and Reaping on the Corn Exchange, 81 Hope Street (1895-6, dem. 1963); Mercantile Chambers, 35-69 Bothwell Street (1897-8); MacSorley's Bar, 42-4 Jamaica Street (1898); the Connal Building, 34 West George Street (1899-1900); and the Liverpool and London and Globe Insurance Building, 116 Hope Street (1898-1901). At the Fine Art Institute, Young carved the building's decorative work from models by the Mossmans , whilst at Mercantile Chambers he worked from models by F D Wood . In the 1890s, Young executed the carverwork on C R Mackintosh 's Glasgow Herald Building, Mitchell Lane (1893). Young was one of Glasgow sculptors chosen to execute the carver-work on the facades of Kelvingrove Art Gallery from models by Sir George Frampton (1898-1900). The statues of Britannia, Commerce and Justice, as well as the carver-work on the Clydesdale Bank, 94-6 High Street, Dundee, for architect William Spence (1876); the sculpted animals in the interior of the Coats Observatory, Paisley (1882-3); the font at Lochgilphead Parish Church (1884); the carver-work and statues of The Seasons on the George A Clark Town Hall, Paisley (1879-82); the statue of Vulcan on Coatbridge Municipal Buildings (1894); and the carvings on Brechin Cathedral (1900-01); and Holy Trinity Church, St Andrews (1907-9). The years 1907-9 also saw major alterations to the Merchants' House in Glasgow, the building which provided Young with his first important commission for architectural sculpture in 1875-7, and which involved the dismantling of the building's original tower and the relocation of its medallion heads, together with a pair from its western turret, to the upper level of the building's heightened rear elevation overlooking Anchor Lane. Also dating from this period is the Glasgow Cathedral Font (1919); the Madonna and Child on St Anne's Church, Corstorphine, Edinburgh (1912-16); the carver-work on the Scottish Legal Life Assurance Society Building, 81-107 Bothwell Street, with Archibald Dawson as the principal modeller (1927-31). The firm was also responsible for the carvings on the Mercat Cross, at Glasgow Cross, including the heraldic unicorn modelled by Margaret Findlay for Scotland's first female architect, Edith Burnet Hughes (1929-30). James Charles Young died at the age of 83 on 31 May 1923, at 145 Buccleuch Street, of Carcinoma of the stomach. He left an estate valued at �2,464.7s. He was buried in Craigton Cemetery, Govan, his grave marked by a monument surmounted by a standing angel, which he and his wife had erected after the deaths of two of their children (both of whom were called Charles, the first of whom died in 1875, and the second who died in 1885). The angel has since been toppled and now lies headless and wingless on the ground. James Augustine Young was born in Lancashire, England. As well as assisting his father on his projects in Glasgow, he was later involved in the rebuilding of Paisley Abbey, for which he produced the ceiling bosses in the choir to designs by the Glasgow architect Peter MacGregor Chalmers and Edinburgh's Sir Robert Lorimer (1912-28). Photographs of Young and his carvers working on the ceiling bosses in their worksheds are on display in the Abbey museum. He lived at Dinnel, 3 Lochend Drive, Bearsden, and died on 6th April 1934, at the age of 63, at the Western Infirmary, Glasgow, the cause of his death being recorded as: Haematemesis from Oesophageal Ulcer; Pyogenic infection of the left kidney pelvis; Thrombosis and left femoral artery. His death was registered by his widow, Edith, whom he had married on 21 June 1924. 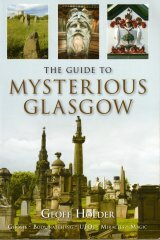 The team at glasgowsculpture.com is grateful to Caroline Gerard for investigating Young's census returns on our behalf.